This and many future blogs to come were saved by my good friend Jason Lawrence, who saved my hard drive from my former laptop (RIP). A big thanks to him! If you ever need IT work, Jason is your guy! 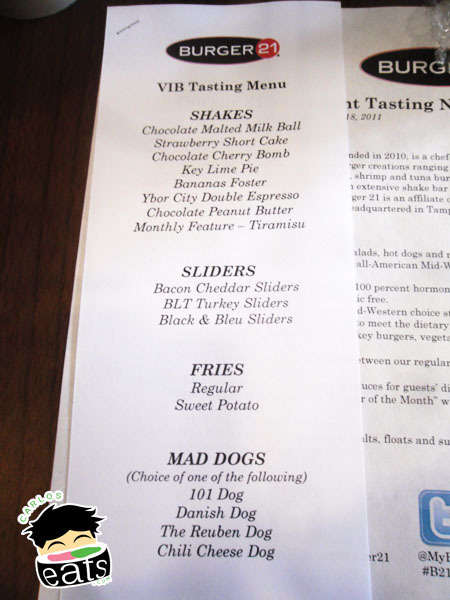 I was invited to Burger 21 for their VIB: Very Important Blogger “Slide into Summer” Tasting a few weeks ago. This tasting was a complimentary event for local bloggers. 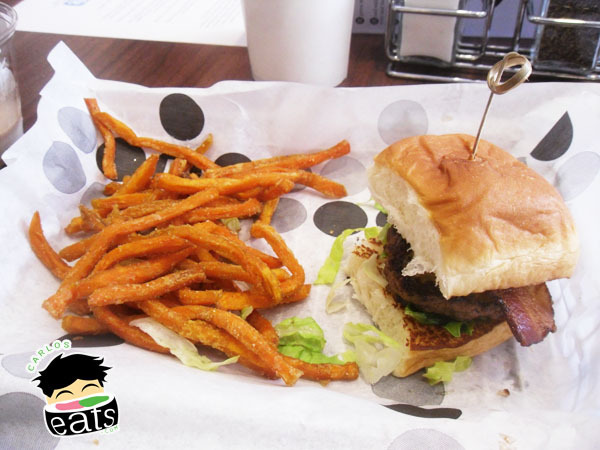 Burger 21 is frequently buzzed in Tampa by local diners (It is currently #1 in Tampa on Urbanspoon) and my excitement was built by many of my Twitter followers, who claimed Burger 21 has the best burger they have ever had. A bold statement indeed. I made it to Westchase early to avoid the 275 rush hour traffic. The Veterans Expressway made the trip shorter than expected. It was my first time the neighborhood and Westchase is simply beautiful. Burger 21 picked a nice place to drop their first restaurant. I was the first one to arrive at the tasting. Two tables were reserved in the back of the restaurant for diners. Burger 21 has a diner feel to it, but is spotlessly clean and there are many windows that allow light into the restaurant…perfect for taking photographs at a food tasting event. I got hooked up to their Wi-Fi and was live-tweeting before I knew it. As you can see I was about to have a food feast! Many other bloggers, writers, and social media personalities made it to the event. I was re-united with some old friends and I met many new people as well (some frequent readers of this blog). The staff at Burger 21 was completely hospitable to us and after a few minutes the first of our first of seven shakes arrived. 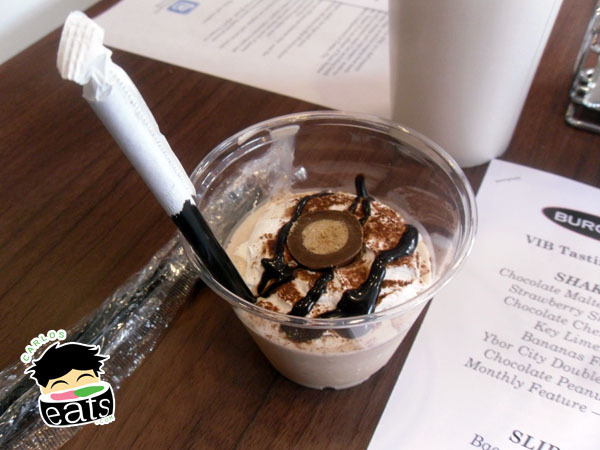 The first shake was the chocolate malted milk ball shake. Burger 21 paid attention to detail on their shakes. They only use Blue Bell ice cream in their shakes. They were all perfectly made to the smallest detail in appearance. Fellow blogger Tender B. and I both agreed that the sweetness was not over-powering. It was a nice starter, but the shake I was awaiting was the tiramisu shake. The food and shakes came out quickly and before I knew it the first slider arrived. The bacon cheddar slider and sweet potato fries. The slider was certainly much better than your average slider. I loved the bacon inside, but it was a little hard to compare the burger to a real burger when it was clearly made well-done and doesn’t have the complete properties of a true burger. The sweet potato fries were excellent! I seriously fell in love with them.They were a perfect mix of sweet and salty. I experimented with many of the sauces at Burger 21 and the Thai Ketchup was my favorite. It has a kick to it in a way that regular ketchup just cannot compare. True story: Since trying Burger 21’s Thai Ketchup I am dissatisfied with regular ketchup and feel like there is something missing every time. The next slider was Burger 21’s BLT Turkey Slider with regular fries. I do not like turkey meat burgers…my Step-Dad makes them at home and those are the nights I tend to avoid the house, however Burger 21 actually did a great job on their BLT Turkey Sliders. The turkey meat was moist (something you don’t normally find in turkey meat after it has been cooked) and I actually enjoyed the slider. The regular fries were good, but could not compare to the amazing sweet potato fries. 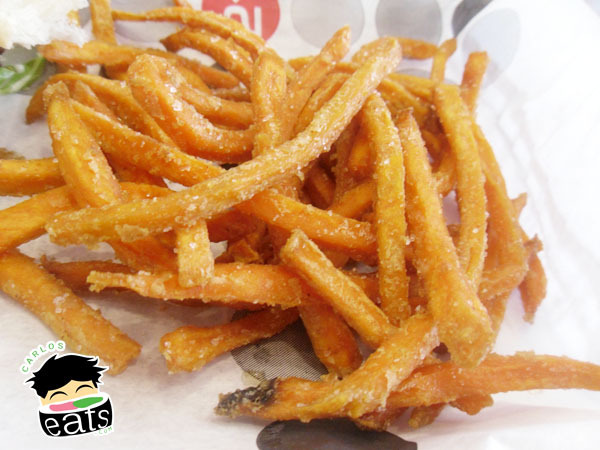 I would order the sweet potato fries on every visit to Burger 21. The strawberry short cake shake was the next stop on this tasting adventure. One thing I noted was how fresh the fruit tasted. 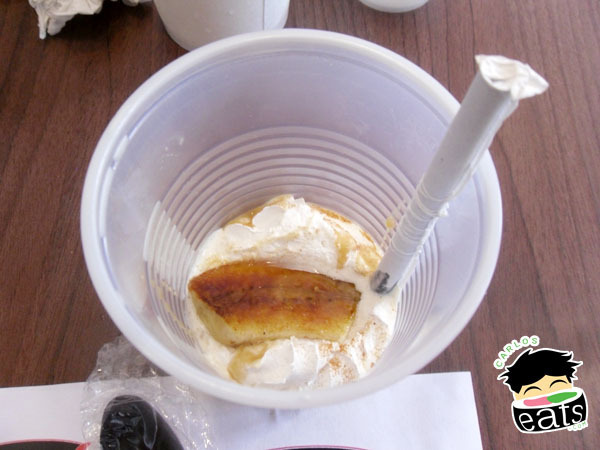 Anytime Burger 21 used a shake that incorporated a fruit you could taste the real fruit in the shake. They put just the right amount of sweetness for my taste buds. Some places add tons of sugars when fruits naturally sweeten a drink. The Ybor City double espresso shake was delicious! 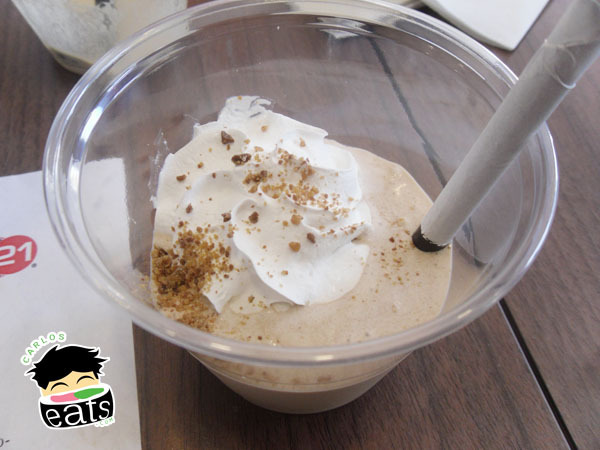 I love food creations involving coffee, such as coffee cake, and this double espresso shake could stand alone without a meal. It had a coffee taste without a bitter after-taste. 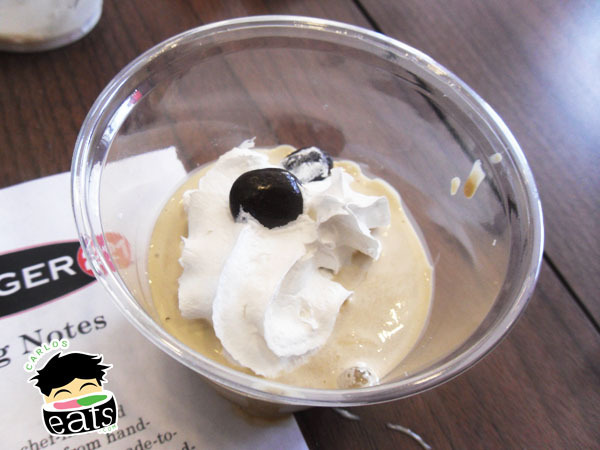 It made me think of the tasty coffee shakes I have at Cafe Kili – refreshing. The black and bleu slider was my least favorite slider. It has a smoked taste and was quite dry. In my opinion it would benefit from some different toppings and a signature sauce. The chocolate peanut butter shake was probably the only shake I disliked. The balance of chocolate to peanut butter was off and it ended up tasting more like peanut butter blended with sprinkles of chocolate. There was still more food and shakes on the way (including my anticipated Tiramisu shake) so I only had a few sips of the chocolate peanut butter shake before moving on. 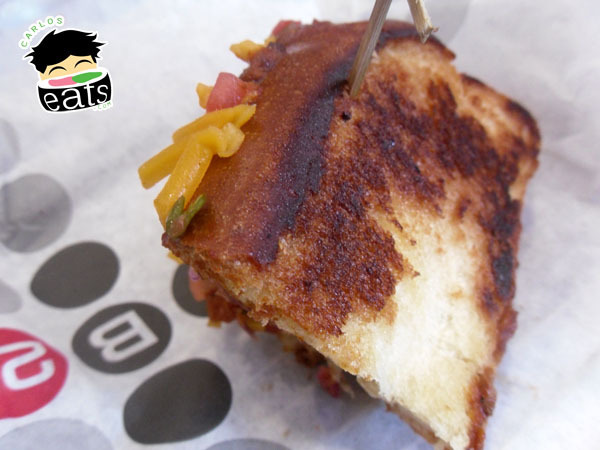 Burger 21 is known for having some of the best hot dogs in Tampa and only uses Hebrew National hot dogs. From the 4 hot dogs offered I decided to go with the chili cheese dog with no jalapenos (I’m sensitive to spiciness -__- let’s hope I fix that in Korea). Losing the jalapenos did not detract from the taste of the hot dog. WOW. 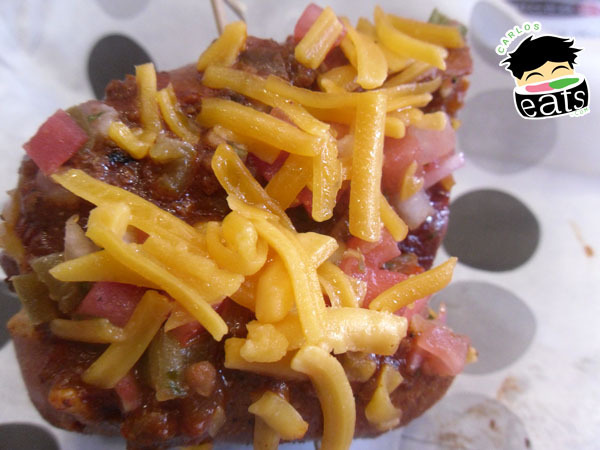 This has to be the best chili cheese dog I have tasted in Tampa Bay. Better than Mel’s Hot Dogs near USF, though a different style. 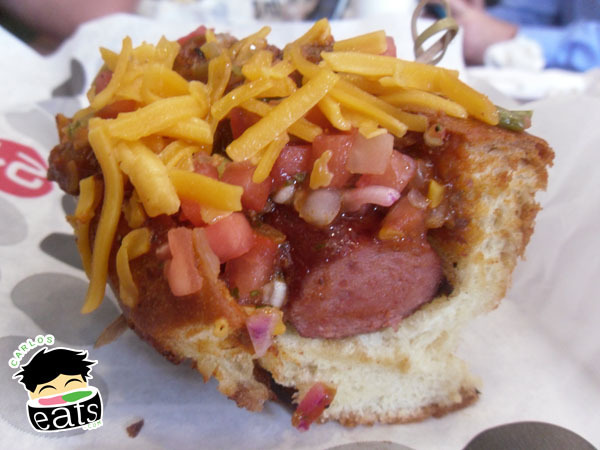 The toasted bread bun was delicious as well and completed the chili dog. 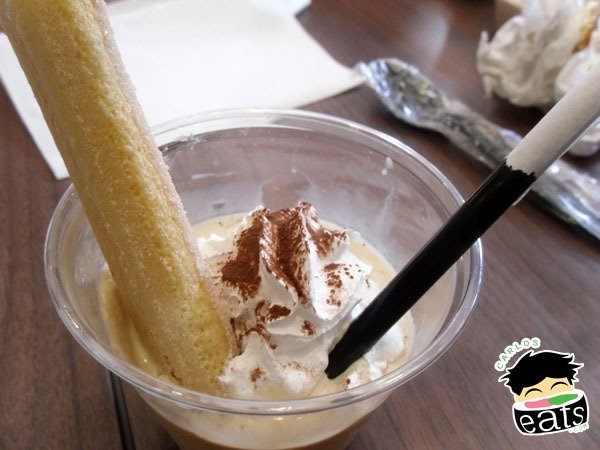 Finally, the tiramisu shake (monthly feature during my visit as well) arrived in front of me! My favorite dessert in the world was now in front of me in shake form. It was great! Fellow diner Chandra Lee and I agreed that it could not replace a true tiramisu, but in my opinion it came pretty close! I especially loved the presentation of the shake. The banana foster shake rivaled the tiramisu shake well. Many people claimed it was their favorite. I think I could put in on the level of the tiramisu. 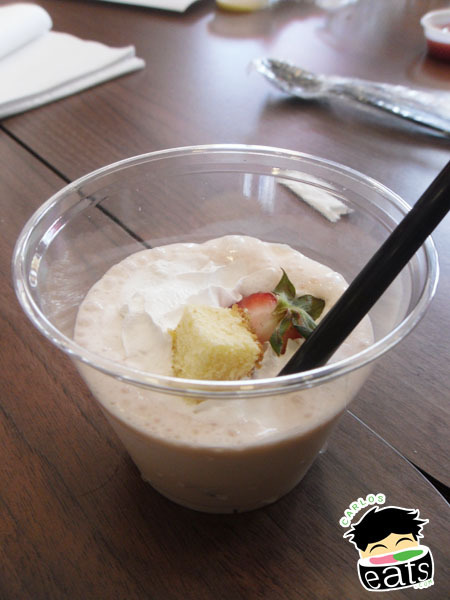 The taste of banana was fresh as was the strawberry, but far superior in overall taste and mixture. 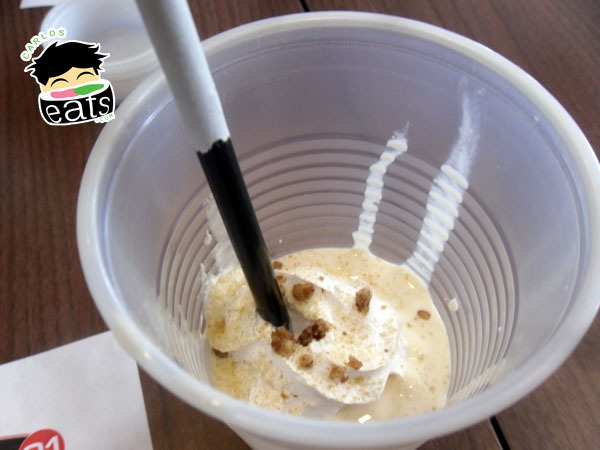 The final shake: the key lime pie shake came after all the others and everyone was stuffed before it arrived. I tried to evaluate it fairly, but decided I was far too full to fairly evaluate it. Maybe someday in the future. Overall, Burger 21 has many great things on their menu. I enjoyed the sliders, shakes, and fries. The sweet potato fries were delicious and I fell in love with their Thai Ketchup sauce. My two favorite shakes were the Tiramisu and the Banana Foster shakes. 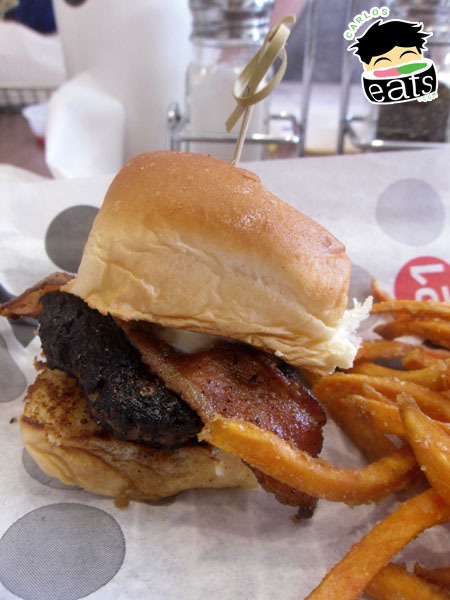 I want to go back and try their burgers again someday with and see how a true burger fares against the sliders. I read online that their Ahi Tuna burger is excellent and I hope to try it one day. Burger 21 is opening a new location on North Dale Mabry in Carrollwood this Fall so I imagine a burger battle will be brewing for who has the best burgers in Tampa. The Carlos Eats Team will be there to cover it when it opens. How exciting! An event like this would be a blast! At the same time though, they got to specially prepare for this and as a food blogger you have to wonder if their food is always the same. I’m glad you were able to save the stuff on your hard drive. I can only imagine the feeling thinking that you’ve lost your stuff. YUM! I really wish I could have made it to this event: so fun. 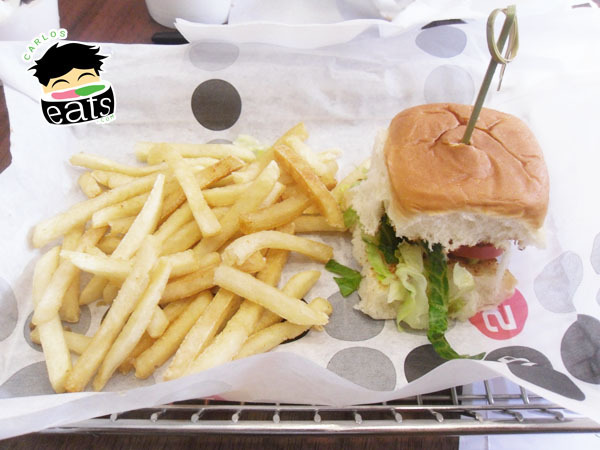 I’ve been to Burger21 once in the past, and I really enjoyed it! Since I can’t eat red meat, they were really great and allowed me to get a turkey burger patty with the regular burger toppings (instead of just getting the turkey burger they have listed on their menu). I totally agree with you on the Thai ketchup- so good! Have you ever bought any of the Melinda’s brand of ketchups? I buy the Habanero one and it is so delicious…but they also have Jalapeno and Chipotle flavors too.